For someone like me, FOMO (Fear of Missing Out) is a real deal. 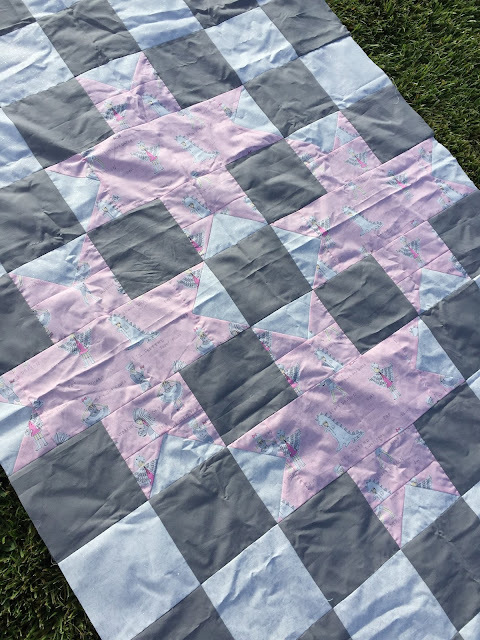 Therefore, I couldn't let Yvonne of Quilting Jetgirl's Snowflake Shimmer Quilt Along go on without me! Especially not, given the incredible line-up of sponsors she's rounded up, and a free pattern. The thought of missing out on all the fun was too much to bear. I had some scooped up some Act It Out in Pink from Sara Jane's Let's Pretend collection for Michael Miller at the Black Hills Quilter's Guild show this summer that was crying out to be in a quilt for my three-year-old daughter. My top's a little different, as I extracted the center medallion, rotated it out of on-point position, and added a few more rows to get the top up to toddler bed-size. The background squares stand out far more than the subtle pink print, but I don't mind the checkerboard effect. I plan to quilt this one simply, for daily use by a preschooler. We'll see how that works out for me, as I have an inclination toward more elaborate free-motion. I'll be back soon, but until then, check out all the other quilt along participants.